First, it’ll be a while before there’s an update as I get my new PC system set-up together. I’ve got the basics set up right now, but I still have a lot of things to re-install, program compatibilities to test, etc. While I have some new material done (including some new 1989-related scratch-made sprites and portraits), it’s not enough for a decent update. Sorry for the delay and I’ll be back to slinging pixels in early April. 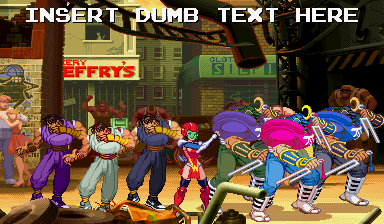 GFX Generators – Guy and Sodom (from Capcom’s Final Fight and Street Fighter series) now have ALL of their arcade palettes from Street Fighter Alpha 1-3. The Teenage Mutant Ninja Turtles and Splinter (currently found in the Konami section) now have their big portraits from TMNT: Turtles in Time. Wonder Momo now has a sprite based on the ShiftyLook Wonder Momo promo pic by Omar Dogan. You’ll also find a really simple recreation of the first stage of Wonder Momo in the “Comic 88×136” and “Box 160×192” styles for the GroupShot generator. The Treachery in Beatdown City Kickstarter needs to be funded. It’s a tactical turn-based beat ’em up (Role ’em up?) that has a great premise and NES/SMS-era look, so check out their pitch and help if you can. I made that Wonder Momo sprite because, sadly, the ShiftyLook site will be closing down on March 20th. It still boggles my mind that we even got to see top-notch web comics for some of lesser-pushed Namco properties like Bravoman, Wonder Momo, SkyKid, the Valkyrie series and many others, so at least it was around for a while. We even got an animated Bravoman show (with the ever-awesome Rob Paulsen voicing Bravoman), a Wonder Momo anime, new games for both series, and a bugged-out Mappy show. As much as I was hoping they’d be able to get enough material together for an all-Namco Saturday Supercade-style show, it was great to get what we got. Luckily, some of the Bravoman and Wonder Momo strips have hardcover collections, which I plan to buy. There’s talk that some of them could continue in meatspace comic book form if the collections do well, so buy the books! Go read the strips while you can and be sure to check out the beautifully insane Galaga comic.